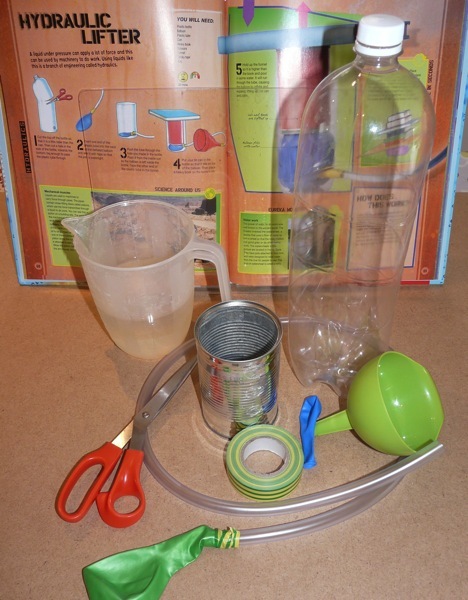 This hands-on hydraulics experiment is a fun way to investigate the power of liquids. 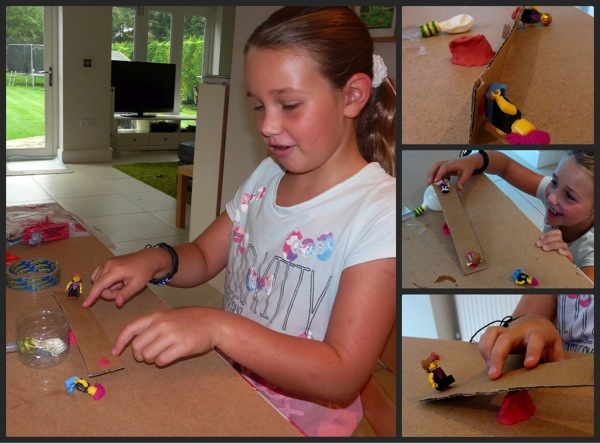 We used hydraulic power to create a simple machine which our Lego mini figs – and all the family – had fun playing with. Our hydraulic theme-park even inspired a movie! A liquid under pressure can apply a lot of force and this can be used by machinery to do work. Using liquids like this is a branch of engineering called hydraulics. 1. Stretch the balloon by blowing it up and letting the air out again. 2. Attach the tubing to the empty balloon and seal the join with tape. Check the join is water-tight by attaching the funnel to the other end of the tube and filling with water. Remove the funnel and drain out the water. 3. Cut the empty bottle so that it is just a little taller than the can. (We should have cut a bit more off ours.) Use a pencil to make a small hole near the bottom of the bottle. 4. Feed the free end of the pipe through the hole in the bottle, leaving the balloon inside. 5. Put the heavy book on top of the bottle. 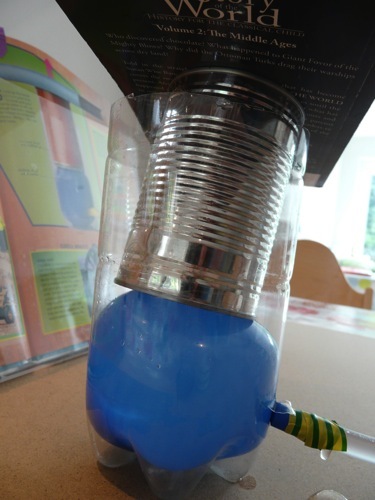 The water-filled balloon lifts the can, which in turn lifts the book. The balloon feels very firm. 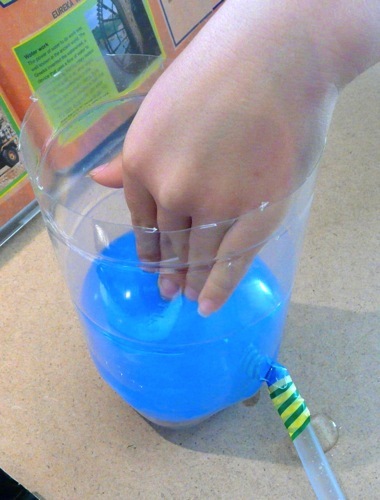 The weight of the water in the funnel creates enough pressure to force water into the balloon. This force is in turn transmitted through the balloon to lift the book. Fluids transmit forces more effectively than gases because they can’t be compressed, even under pressure. We wanted to apply what we’d learned to create something like this very cool hydraulic elevator. Unfortunately we couldn’t get our syringes and pipes sealed tightly enough to make it work. 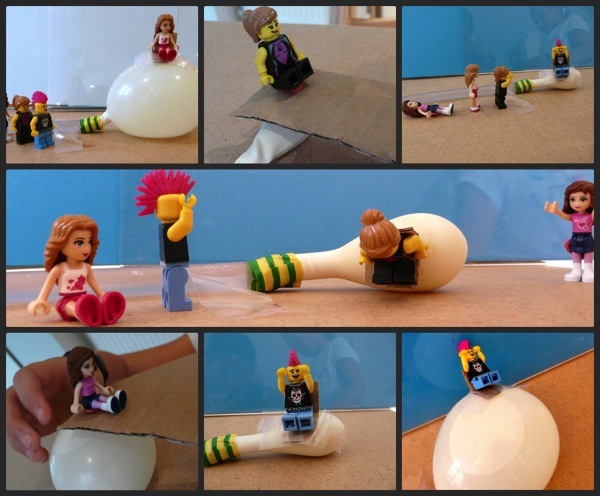 Instead, C(9) had the idea of using hydraulic pressure to create a fun ride for Lego mini figures. Liquids are used in many kinds of machines to carry force through pipes. Most of us rely on hydraulic machines every day, for example when we apply the brakes in our cars or fill them with petrol, and even when we run the dishwasher. Hydraulics is used to design piping systems, pumps, propellers, water turbines, hydraulic presses, and flow-measuring devices. We enjoyed dipping our toes into hydraulic principles. 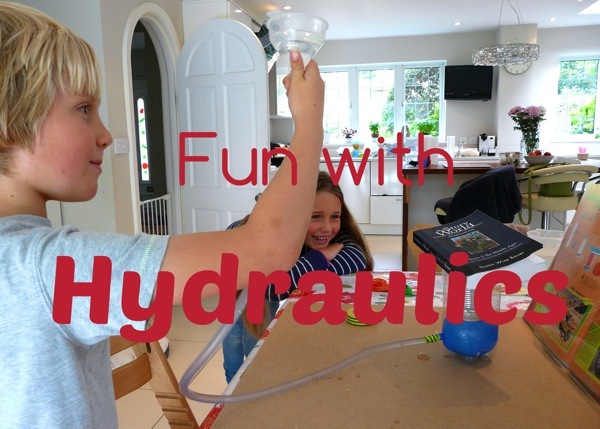 There are lots more hydraulics experiments I hope we’ll do in the future. They’re a great hands-on way to learn about the laws of physics, such as Pascal’s Principle. For more pressure science, see our air pressure experiments. I like how C turns it into a movie trailer. It’s a great extension to the experiments. Thanks Hwee. C really did have a ball making her movie. Awesome! 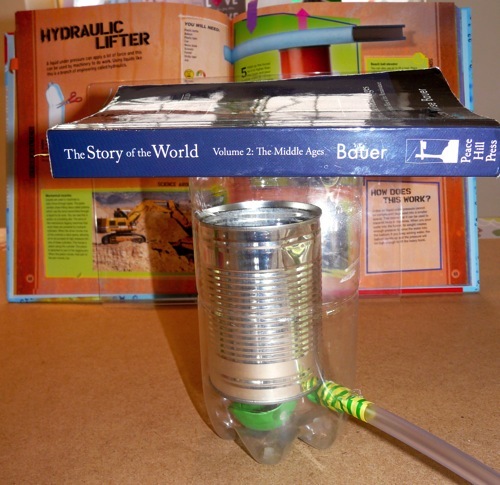 We have so many earth science projects planned for this year, but this post and your cool hover-craft experiment are making me think some kind of engineering theme would be fun for next year’s science. I’m definitely pinning this one. Thanks, Julie. You’ve been a big inspiration for our engineering projects! C(9) has been reading inventions books for the last few months since your series on The Story of Inventions. 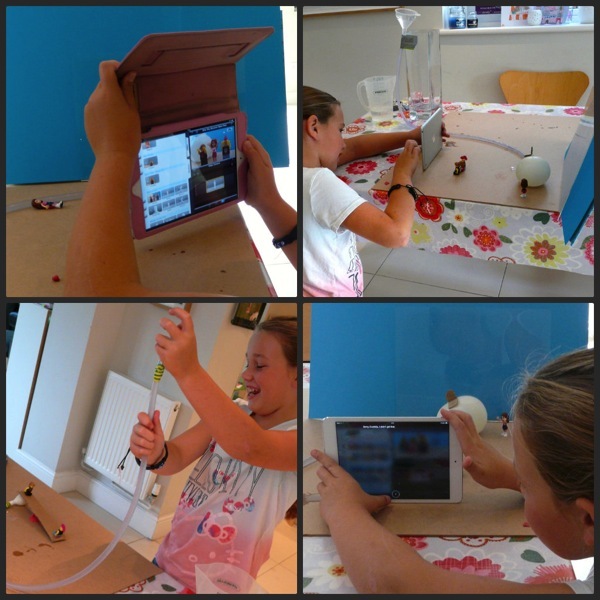 Gosh that girl’s video has inspired many! Makes me wonder about maybe putting some of our stuff up on You Tube! That would be so fun to do! My kids would love it. Thanks so much for linking to Science Sunday! I’m not sure what the problem was, Brooks. But if you search “hydraulic elevator” on YouTube you should find it. Thanks for stopping by, Flora! Hi, great stuff. What is the book the experiment is from?